Welcome To NetKnots.Com | The Most Trusted Knots On The Net. How to tie the Aussie Quickie Knot. The Aussie Quickie is a braided line to fluorocarbon leader joining knot popularized by Australian skipper Captain Scott Walker. The knot starts out with a double line in the braid usually formed by a Bimini Twist. Once the Bimini is tied, the Aussie Quickie attaches the fluorocarbon leader in a matter of seconds. The Yucatan Knot is essentially the same knot but tied in a different manner. There is an interesting dynamic here; with the Yucatan, the wraps are made with the double line and with the Aussie Quickie they are made with the single line leader. But with both knots, when pulled tight, the coils form in the leader material and the finished knots look identical! The Bristol Knot, also called the No Name Knot, is very similar. All of these make good knots for connecting a double line braided system to a fluorocarbon leader. Practice tying a few of them and pick the one that you like the best. 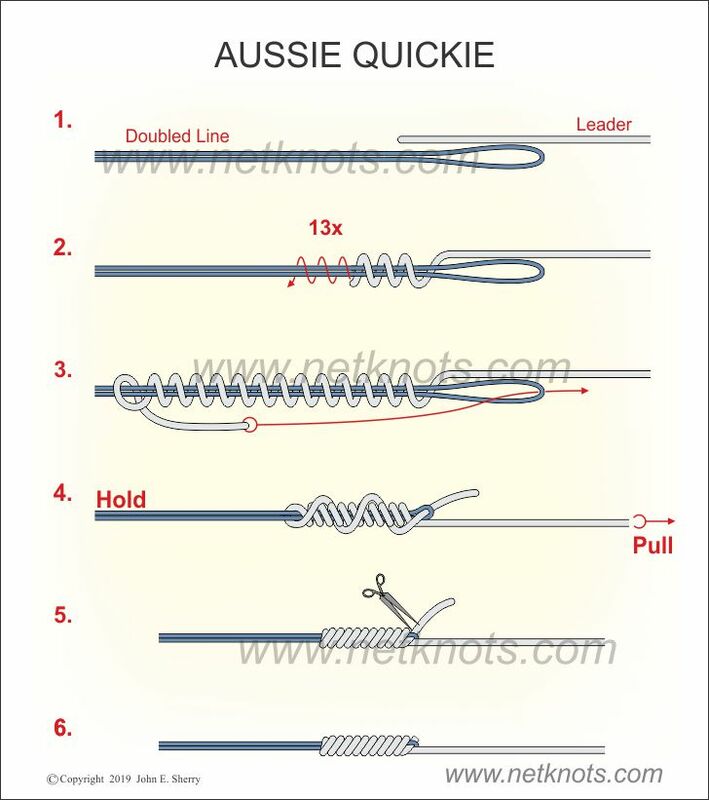 Scroll down to see the animated Aussie Quickie below the knot tying tutorial. Tie a Bimini Twist knot in the main braided line to create a double line section loop that is the desired length. A triple Suregeon's Loop or Spider Hitch could be substituted here for speed, but you will lose a little strength. Lay about six inches of the fluorocarbon leader alongside the double line. Begin wrapping the leader around the double line right behind the loop end, working away from the loop. Make exactly 13 wraps. Now take the tag end of the leader and bring it back to the loop. Pass it through the loop and pinch to hold there. While holding the double line firmly begin pulling on the leader (let the tag end hang free) . The leader coils will wrap neatly together leaving a tag end sticking out from the knot. Trim close to the knot after pulling very hard on both lines to set the knot firmly in place. Disclaimer: Any activity involving rope can be dangerous and may even be life threatening! Knot illustrations contained in this web site are not intended for rock climbing instruction. Many knots are not suitable for the risks involved in climbing. Where failure could cause property damage, injury, or death, seek professional instruction prior to use. Many factors affect knots including: the appropriateness of knots and rope materials used in particular applications, the age, size, and condition of ropes; and the accuracy with which these descriptions have been followed. No responsibility is accepted for incidents arising from the use of this content.